When in 1845 the Southern Baptist Convention became the biggest Protestant “splinter group” in history–over the issue of slave ownership–women were expected to occupy a place subordinate to men. Since they were to be “silent in church,” giving their money was the only way for Southern Baptist women to make a contribution. Over the years Baptist women have gained ground toward equality only to be driven back to their “place.” In Southern Baptist Sisters David Morgan documents this yo-yoing status of women among Southern Baptists, and shows that in the new millennium Southern Baptist women are officially back where they started more than 150 years ago. 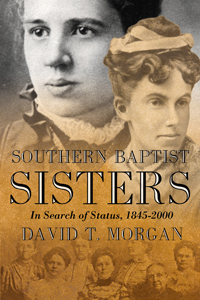 But Morgan also documents the fact that Southern Baptist women nevertheless have made monumental contributions to the life and work of the denomination, and that many if not most of them fully intend to continue their “mission,” regardless.